This page is dedicated to educating our customers about various products, services, and finishes we offer. As if you need more of a reason than looking awesome, the main idea behind lightening the slide is to reduce moving mass. A lighter slide will track faster and therefore get you back on target faster for quicker follow up shots. There is a lot of misinformation out there about slide lightening making your slide weaker, etc. While that could certainly be the case if someone removed too much material from the wrong areas - it's far form the case with our slide cuts. The fact of the matter is out of thousands of slides we have milled, only ONE has cracked. It was a prototype slide of a new cut. We addressed the issue, and that cut has now been done on hundreds of slides now with zero reports of issues. So you're on the fence about putting an optic on your pistol? Or maybe you know you want to do it but you're thinking of using a dovetail mount instead? First, let's cover why someone would want an optic on their pistol in the first place. For many of our customers, it's aging eyes getting the best of them. They just can't focus on iron sights like they used to and it's hindering their shooting. A red dot is the answer for them. For other shooters they simply want to be able to shoot faster and more accurately. While there is a learning curve to shooting a slide mounted optic, you will simply never shoot faster or more accurately with iron sights than you can with a red dot IF you're willing to get over that learning curve. So why get your slide milled vs using a dovetail mount? Many reasons. Not only does it look much better and cleaner, the optic will have considerably more support being in a pocket on the slide. A dovetail mount will only offer support on the mounting screws and recoil bosses whereas a milled slide will also offer support in front and behind the optic. If that isn't enough reason, having the dot lower to the bore axis also makes hold overs and unders considerably less dramatic than a dovetail mount which will place the optic much higher over the bore. Comparing optic X to optic Y is something that everyone has their opinion and those opinions sure are loud. So what's our opinion? And it's really just that - our opinions based on what we have experience with feedback from our customers. 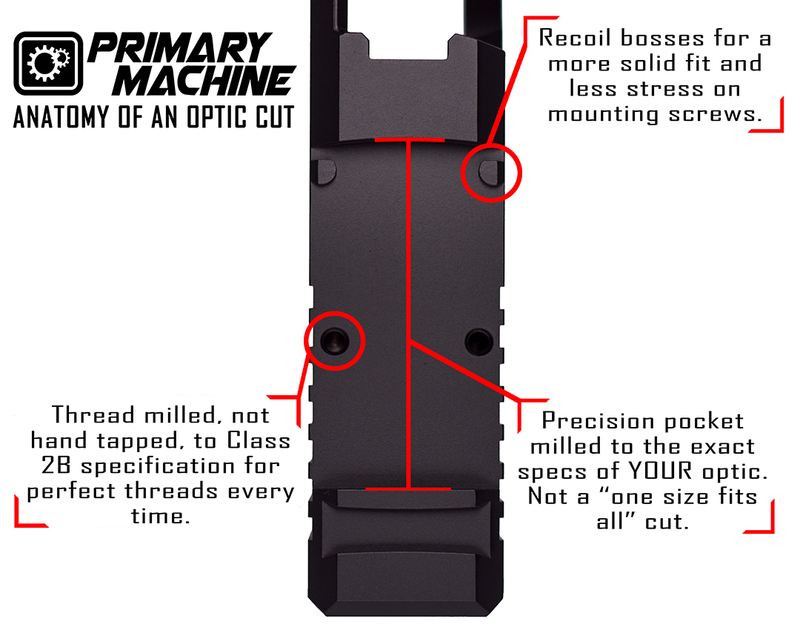 Trijicon RMR: The RMR is an optic we never hear of failing *as far is internal issues are concerned*. While the gen 1 RMR's do tend to have hit and miss issues with battery flicker, we have never heard from one of our customers that theirs has failed due to some sort of internal failure. Trijicon has supposedly fixed the battery flicker issue with the Gen 2 RMR's. Time will tell if that is indeed true, but the changes they made to the battery area definitely look promising. Vortex Viper: The Viper has quickly became an extremely popular optic we mill slides for. By the vast majority of accounts, they are very solid optics. We have heard cases of issues with glass coming out of the housing under recoil, but no reports of them failing otherwise. These optics have all been replaced as far as we know under Vortex's VIP warranty which is second to no one else's in the industry. Vortex Venom: Before the Viper began gaining popularity, we milled hundreds of slides for Venoms. Many customers have reported thousands of problem free rounds with them. Overall they seem to be solid optics, although in our opinion the Viper is a superior optic simply due to the smaller profile. Burris Fastfire III: This is another optic we milled hundreds of slides for before the Viper started gaining popularity. We have customers who have reported tens of thousands of problem free rounds on these optics. And just the same we have unfortunately heard of them failing on the first range trip. Like anything else out there electronic - it can fail. By now you can probably see a trend. 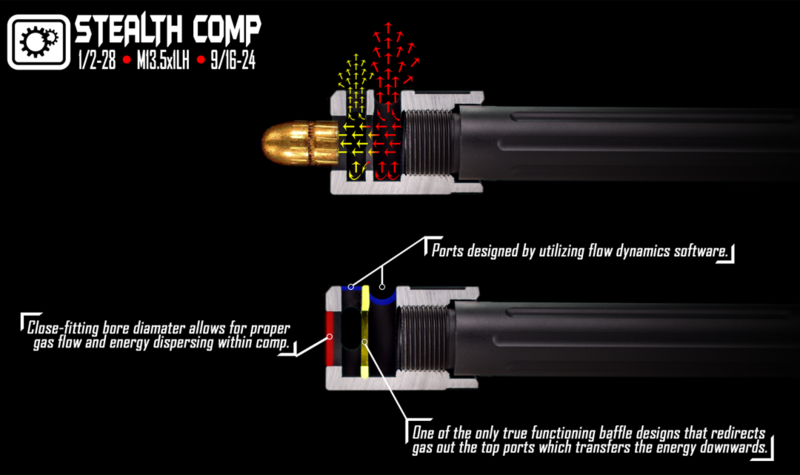 The Vortex Viper absolutely dominates as far as popularity in the ~$215-$250 range. Leupold Deltapoint Pro: Tank. That's the first word that comes to mind. Very robust, big screen, great features. The downside? The thing is just massive. In our opinion it's a fantastic option for someone wanting a competition only gun and doesn't care about iron sights. With how tall this optic is, it makes finding companies who make sights to co witness very, very limited. And it looks absolutely ridiculous with such tall sights. While Leupold does offer a rear sight which can attach to the optic, this still leaves you needing to use an extremely tall front. The only issue we have heard on rare occasion is customers running out of elevation adjustment before achieving zero. To our knowledge, Leupold has replaced those optics and they have been fine. Co Witnessing Irons: Do you need them? Depends on what the gun will be used for. Is this a range or competition gun? If it is, we would say you don't need iron sights. It's simply something else taking up space in an already small optic window. Go to a local match and look at the top guys running optics. You'll notice one thing in common - the vast majority of them are not using iron sights. Are you using it for a carry/defense gun? If so, it might put your mind at ease to have backup co witnessing irons in case the optic fails. Of course it isn't always that easy. Depending on your optic and slide model, co witnessing can involve needing to mill new dovetails, etc. So you just want to go back with a black finish? Black nitride is what you're after. While it is slightly less corrosion resistant than cerakote, it is considerably more durable. We trust you know the importance of keeping a bit of oil on your firearm, so corrosion is a non issue. We use the most highly regarded and highly recommended black nitride QPQ processor in the country. Black nitride offers a hardness of HRC 55 - 70. This is harder than most hardened steel alloys. It is a very rich, black finish with great lubricity features. 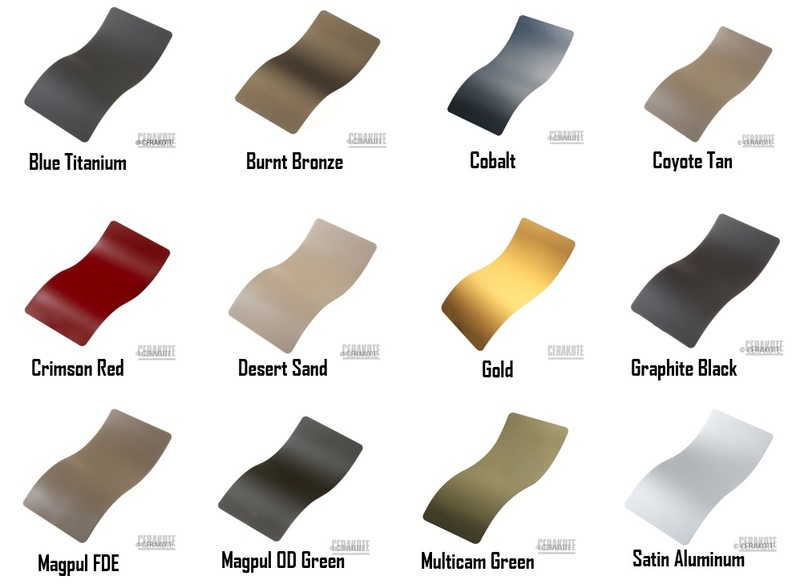 All of our aluminum products are Type III class 2 hard anodized. Anodizing offers a very smooth, even finish and more importantly, it's extremely hard. How hard is it? It's right up in surface hardness with diamonds and sapphires.